It’s been awhile since we last talked about Facebook and we feel that we should, considering that they’ve changed things up again. 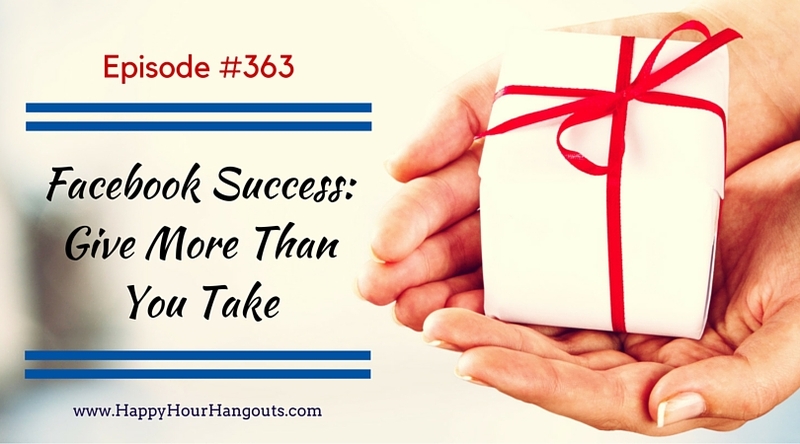 In this episode, Social Media Marketing Happy Hour girls Dawn and Traci tell us why this 2016, it’s important to learn to give more value before taking anything. That is, if you want to market more effectively not just on Facebook, but in all platforms. As marketers, we always try to figure out how to crack the Facebook code but we never really get there. Facebook gives little to no indication when they change their algorithms and so it gets a little frustrating for marketers, especially when you feel you’ve mastered one thing and you find out their already moving on to a new thing. But make no mistake, they are always changing for the better. They are always keeping things relevant and are always making sure people get a good user experience. It’s just a bit difficult when you try to keep up with the changes. We think that the reality is, we’re not supposed to keep up with Facebook – perhaps their sole purpose for the constant change is to keep things relevant and keep their user base firmly attached to the platform. By constantly making changes and improvements, people won’t leave them and go for other social media giants like Twitter, Instagram, and the most recent craze, Snapchat. The spammy type of marketing isn’t going to work anymore. There’s no more gaming or click baiting. Gone are the days of just posting promotional posts or asking for prospects to do something. You also can’t just run traffic to offers like before. In this kind of system, we are ASKING. And it’s wrong to keep asking. When we ask for something, whether it’s an email address, a sign up, a sale – we are taking something from them. And we are taking without even giving them anything in return. Now and going forward, it’s going to be the marketers who give really great content that are going to succeed — great content plus ultra targeted marketing, that is! Facebook’s new algorithm will put a lot more weight on how much time is spent on content. So if you don’t have that wicked awesome content that can make people hang around, you’re going to have a hard time. If you haven’t given anything before you take something, everything is going to be harder for you. It will cost you more to advertise and keep people and it will be harder to convert them into clients because you lack credibility. But if you do it right, it can be money in the bank for you as a marketer. So how do you start giving more than you’re taking? Before you even begin to run traffic offers or advertise your business, consider adding value to the marketplace. Anything that you can give that will make people’s lives better and easier. If you can solve their problem, inspire them, make them feel you’re on their side and you understand them, that is valuable to them. You need to first give something that’s going to help transform or improve their lives, whether it’s a blog, articles a podcast, a video, or whatever. Take for example our very own Social Media Marketing Happy Hour podcast, we provide valuable information to our listeners for free. This is the very reason why we can ask you at the end of each podcast to consider an offer or to click on a link is because we’ve already given much before taking anything from our audience. Imagine if every 3 minutes we ask our listeners to buy something from us, that would just annoy them. So now, here’s a challenge for you, our dear Happy Hour listeners. Ask yourself: What can I offer that would help someone get the biggest transformation in their life right now for free? If you can think of something that will create that transformation for your target audience, you’re going to do just fine on Facebook. If you’ve been asking more than you’ve been giving or if you have other issues that you need help on, apply for a free business diagnostic session with Dawn or Traci at http://HappyHourHangouts.com/coaching.